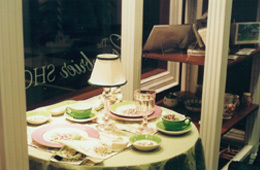 CHANDELYN® by Table Decor International’s giftware line is popular with fine retail specialty stores that want to offer quality made, unique products that their customers will appreciate and return for. Our styles, heavy castings, handsewn flame-retardant shades and beautiful finishes are combined with attractive packaging and affordable pricing and promotions to make Chandelyn® a much requested line. CHANDELYN® can be used in so many different settings,which make it an appealing item for tabletop as well as other areas in a home such as powder room vanities, on a mantle or coffee table, in a foyer, on a porch, by the jacuzzi… the possibilities are endless! 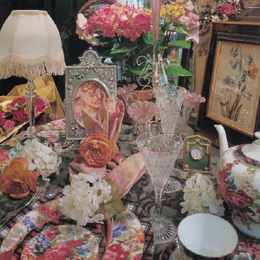 For weddings and special events, for wedding gifts or housewarming gifts, Chandelyn makes a gift to be remembered.
" When I go to market and I come away and there's the one thing you're most excited about... well this is it. Chandelyn by Table Decor is it!" Retailers can display groupings of Chandelyn® lamps and accessories that show many different stylesfrom contemporary silver to a rustic lodge look, or "center-gize" a display with one table centerpiece piece-de-resistance in a table setting! 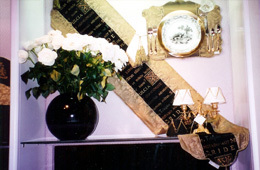 We have made custom pieces using unique fabrics and custom finishes to accentuate a certain store’s look or season’s theme. The lamps are available using candles, convenient liquid fuel cells, new flicker batteries or electrified. 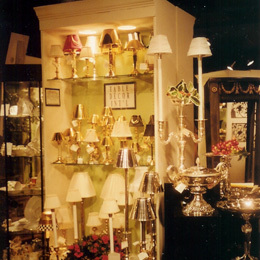 our many repeat customers come back to us because the lamps sell in their stores! 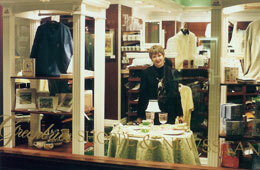 Display at The Greenbrier Shoppe in West Virginia featuring Chandelyn" lamps. Please contact us with trade information for your online customer id and password for wholesale ordering on our website and/or for information on wholesale mart showrooms where you can see Chandelyn® products.